Chena Payasam is a tasty and simple to make payasam recipe. The elephant yam or chena can be described as an edible tuber, mainly seen in the tropical regions. This tuber is called elephant yam because the plant that it is derived from is quite huge and resembles the foot of an elephant to a great extent. The trace minerals and key minerals present in elephant yam include copper, zinc, selenium, phosphorus, magnesium and potassium. Onam is a festival celebrated by the Malayalees. The most important part of thiruvonam is the ‘Thiruona Sadya’. Sadhya is a vegetarian feast or banquet. The multi course meal is served traditionally in banana leaf. The sadya has steamed rice as the main ingredient served with many side dishes. Payasam is a very popular dessert cooked in every auspicious occasion. Peel the skin of the Chena / Elephant Yam and clean them well. Cut the chena into small pieces and cook them in a pressure cooker adding one cup of water. Grind it to a smooth paste using a mixie. Heat a pan & melt the jaggery in 1 cup of water and strain it to remove any impurities. Take a heavy bottomed pan and add the jaggery syrup and yam paste to this. Stir well for 5 minutes. Add the coconut milk and mix well. Add the crushed cardamom pods. Heat ghee in a pan and roast the cashew nuts and raisins. 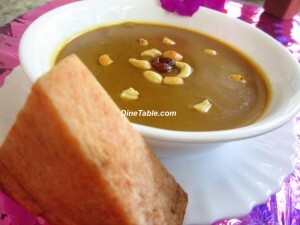 Add the fried cashew nuts and raisins to the payasam. Switch off the flame and cover it. Let it rest for a few minutes before serving. Tasty chena payasam is ready.